Joshua is from Bristol and studied at Harvard before becoming a freelance director. Did he always want to own a venue? “I find buildings and space and architecture really interesting. I found myself often in a room looking at pillars and layout and positions. In Bristol, there is this abandoned old postal office and from my teenage years I dreamed of turning that into a multi purpose art centre. When I left university I had this idea for something called ‘The abandoned project’, which would take abandoned buildings and transform them into spaces for cultural use. I then went into freelance directing and forgot all about this concept for a while. 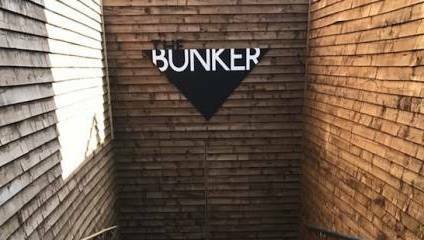 It was only when I was half way through building the Bunker that I realised I’m doing what I wanted to do!” The Bunker feels special, intimate yet open and airy. Seats on three sides mean they play almost in the round and have two galleries that can be used performatively. The underground locations mean no London noise makes it down or up, so there is no trouble with their neighbours the Mernier Chocolate Factory. The Bunker is also completely wheelchair accessible, the bar is open before and after the show for plenty of post show conversations. ‘Woke’ might be a horribly trendy word, but with its young millennial entrepreneur at the wheel, the Bunker is a place thriving for moral integrity, from its recycling bins to accessibility, diversity and programming. The season will close with George Jacques’ Breathe. “George was 17 when he emailed me to put a play on at the Bunker and I thought he might not be ready just yet but we met for a coffee. He had already raised £8000, found an abandoned tunnel, rented it out, constructed a stage, and hired the whole team. He sold out 4 nights with his play! It was beautiful and powerful and he is one of the most exciting theatre makers I have ever met. The Bunker is about giving young companies a chance, and I’ve never met anyone so financially and creatively ambitious at a young age.” McTaggart obviously recognised a fellow entrepreneur and gave Jacques the closing slot of the summer season.